It is the beginning of full blown tomato harvesting in my garden. I planted fourteen plants this year, and three or four other plants have sprung up so I don’t think I am going to be short of tomatoes. I think I’ll be begging for mercy. One of the best summer pleasures for me is fresh tomato on toast with basil for breakfast and I have eaten this a couple of times already. 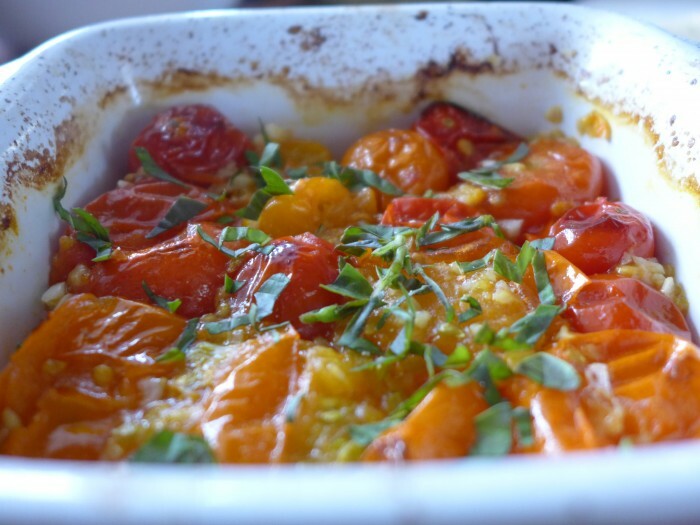 But last night I harvested a big bowlful of orange, red and yellow cherry tomatoes and I thought I’d roast a few to go with dinner as a side dish. They were so delicious that when I got up this morning I roasted some more to have on toast for breakfast. 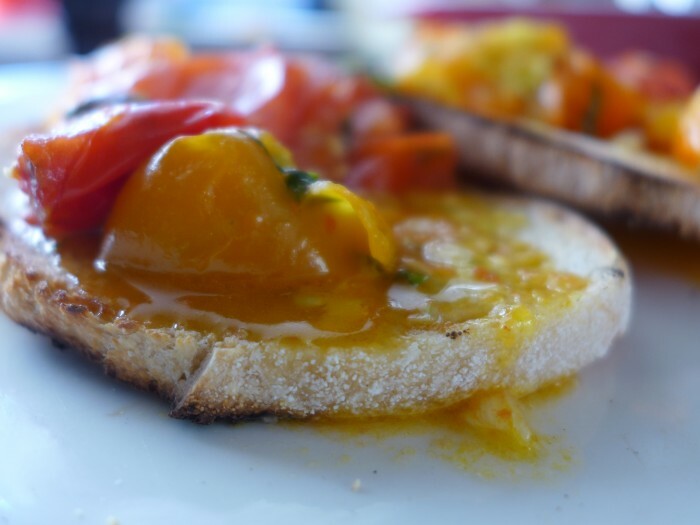 These are really simple to make and you end up with the squishy cooked tomatoes in a garlicky, basil flavoured syrup that is fabulous with crunchy toast. Just as yummy as the recently published stuffed tomatoes but with no work. Let’s face it nobody wants to stuff a tomato first thing in the morning before coffee. These are the kind of tomatoes that I WISH I got at cafes when they offer roasted tomatoes. I have never had a decent cafe tomato. They are inevitably tasteless, underseasoned and not properly cooked, just a warmed up raw tomato – yuk. I am particularly fussy though, I loathe half cooked tomatoes, I prefer them either raw or cooked. Rant over. These tomatoes are proof of my theory that roasting improves everything. Bake in a 250 C oven for about 25 minutes until collapsed and bubbling. Check them after 15 and stir and squish them a bit. Remove from oven and sprinkle with chopped basil leaves. I too am starting to drown in tomatoes and zucchini. So I roasted some tomatoes per your recipe and then used a vegetable peeler to make zucchini ‘noodles’ and voila! Dinner done and dusted. Awesome! And leftovers just as nice for lunch the next day. Great. Must try that myself. What a gorgeous recipe, Rosalie! I do love the sweetness of roasted tomatoes. Thank you so much for joining in on my challenge this month!